Kennedy Space Center is located in Central Florida on the barrier island of Merritt Island. KSC shares a border with the Merritt Island National Wildlife Refugee and is actually considered a National Wildlife Refuge. There is definitely no shortage of birds on KSC. The space center is also home to an abundance of wildlife, including many endangered species. The protected shoreline along the Atlantic on KSC provides an optimal nesting area for sea turtles. It actually has one of the highest populations in the northern hemisphere. Manatees are also very abundant around the center. The photos in this post were taken by my husband, Brian. 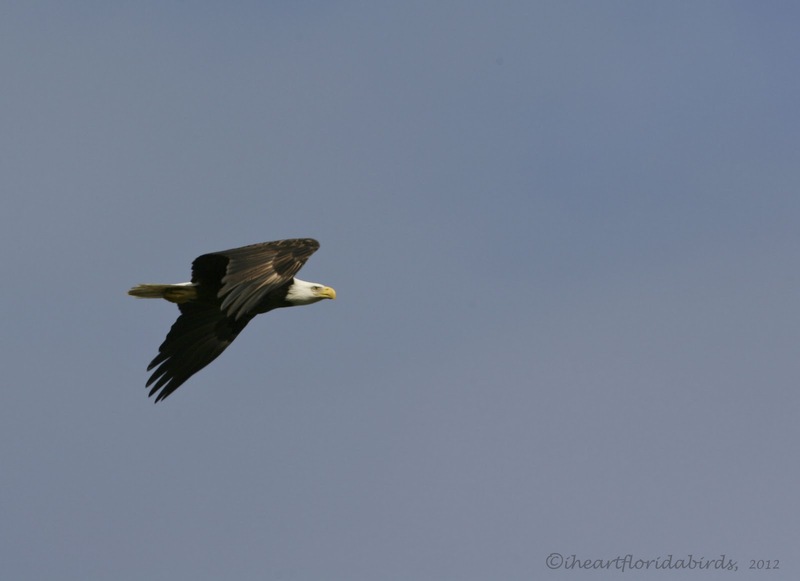 Bald Eagles are another endangered species that reside at KSC. There are currently at least 5 active eagle nests. 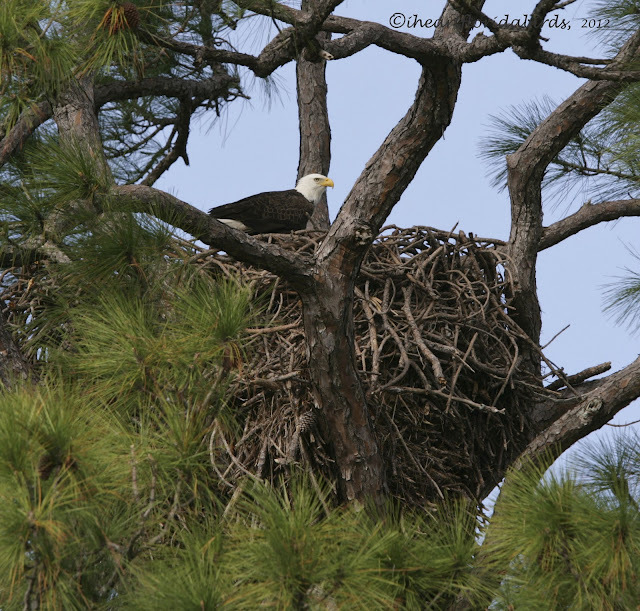 Their nests can reach 6 feet in diameter and are typically occupied September through May. Spoonbills are a popular sight around the space center as well. There bright pink hue makes them difficult to miss. 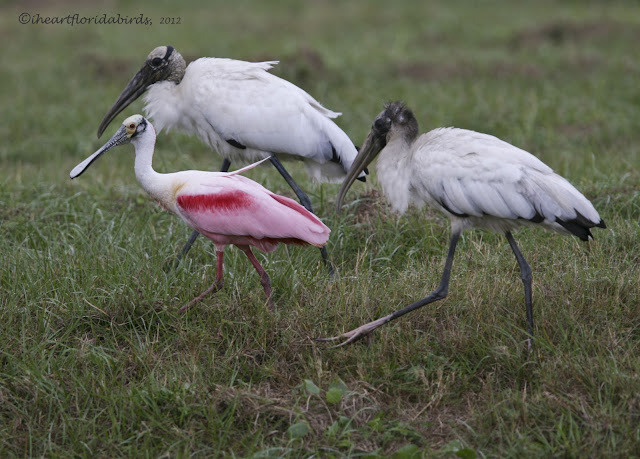 The Spoonbills provide a great contrast to the Wood Storks too. Here's to going to the space center and looking for birds! that eagle aerie is so impressive! i'm so jealous! Thanks, it is quite a bird! Ya know...that Bald Eagle nest and its setting is just beautiful. Schöne Bilder von den Vögeln. I've gotta give props to the eagles since birds of prey are my favorite, but the storks and spoonbills are great, too! It's nice to see something that we don't have around here. His shots are fantastic! they are absolutely fantastic images, i have to say i do have a soft spot for the eagles, what beautiful majestic creature. As per usual you take some stunning images. Thank you! I feel the same way about eagles! How spectacular it must have been to witness these grand eagles! Just incredible. I'm at a loss for words. Thank you for stopping by Adam! I hope you make it to Florida! Brilliant photography. The Bald Eagle and Roseate Spoohbill are terrific. Love that first flight shot, really impressive. The rest of the pics are equally great. Thanks Alan! The Eagle is an impressive bird to view! Love the blog - superb pictures. I really must make the effort to get to Florida! Thank you Bryan! I hope you get to visit Florida, lots of great birds! Wonderful post filled with outstanding photographs! I did not realize that the Kennedy Space Center was a National Wildlife Refuge. Sounds like a beautiful place to visit. The Bald Eagle nest is quite impressive. What a sight! 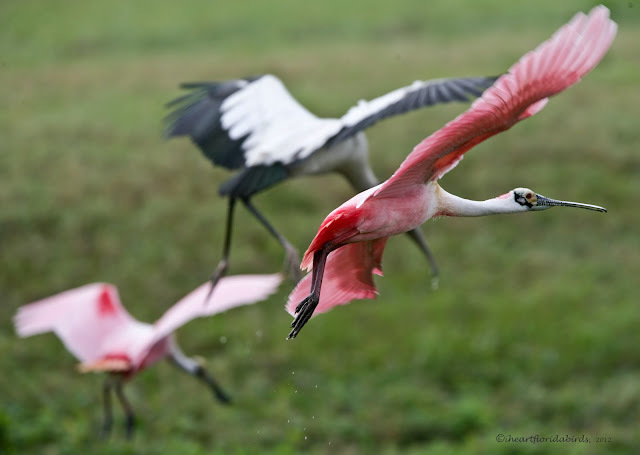 Love the stunning pink spoonbill and prehistoric looking Wood Storks. I think I might have to plan an excursion to that area next time I'm in Florida. Thank you for wonderful comments Julie! My fascination for birds of prey makes me longing for this white headed bald eagle. Wish I will meet one in the future, this is the majesty of birds I think, - well done ! It is quite a sight Lorents! I do hope you see one! The Bald Eagle is great, lovely shots. Tammy, otra de tus maravillas, espectaculares, otro gran trabajo.